Tatum is a handsome red brindle, with a huge white blaze on his chest, 18-month-old male born April 14, 2003. 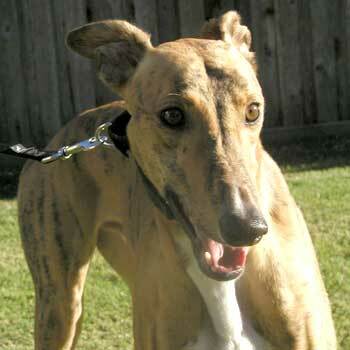 His sire is Buzz Around and his dam is Gable Bashful  he is one of 8 pups in the litter! 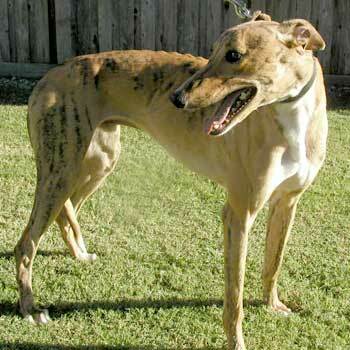 Tatum completed his schooling, but just was not a competitor on the track, so here he is, looking for his forever home! He is very well-behaved and is a quick learner in his obedience training. Tatum is extremely people oriented and gets along well with other large dogs. It is not known at this time if he is small animal or cat tolerant.